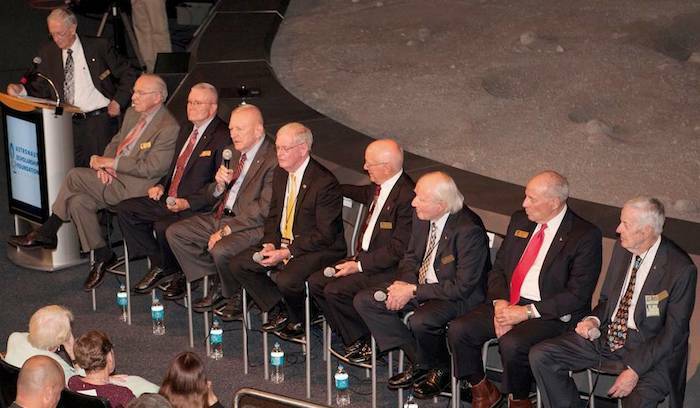 At a recent Apollo 13 gala, a panel discussion included backup LM pilot Charlie Duke, far left, and, seated from the left, Apollo 13 commander Jim Lovell, LM pilot Fred Haise; flight directors Gene Kranz, Glynn Lunney and Gerry Griffin; and support astronauts Vance Brand, Jack Lousma and Joe Kerwin. A gala celebration recently took place at the Kennedy Space Center's Apollo/Saturn V Center, commemorating the 45th anniversary of what has been termed "NASA's finest hour." The event was a reunion of key players in the mission of Apollo 13. What was to have been the third lunar landing in April 1970, became a struggle to safely return the crew when their Apollo spacecraft was crippled by an oxygen tank explosion. Apollo 13 commander Jim Lovell and lunar module (LM) pilot Fred Haise were on hand on April 11, 2015, to recall the events of 45 years ago. Also participating in a candid panel discussion were backup LM pilot Charlie Duke, support crew astronauts Vance Brand, Joe Kerwin, and Jack Lousma, along with flight directors Gerry Griffin, Gene Kranz and Glynn Lunney. These space icons shared their stories reflecting on the mission that brought global attention to the determination of a broad-based NASA team in government, industry and academia. The evening's program began with a recorded video presentation by NASA Administrator Charlie Bolden who had high praise for those who successfully brought the Apollo 13 crew home. "Together with (command module pilot) Jack Swigert, these men helped advance our exploration goals through their perseverance and level-headed thinking during a near catastrophic emergency in space," he said. "Their experience made it possible for the rest of the Apollo Program to continue." The Apollo 13 crew of Lovell, Swigert and Haise lifted off from Kennedy on April 11, 1970. It was a mission to explore the moon's Fra Mauro highlands. The third member of the crew was supposed to be Ken Mattingly, but he had been exposed to German measles and was replaced by his backup, Swigert. Two days into the mission, with Apollo 13 approximately 205,000 miles from Earth, the astronauts heard a "loud bang." It was accompanied by fluctuations in electrical power and automatic firing of the attitude control thrusters. "Houston, we've had a problem," Lovell said. "We've had a main B bus undervolt." A "main B bus undervolt" indicated there had been an abrupt power loss from one of the command-service module's two main electrical systems. Kranz and members of the flight control team were looking, but initially, what they were seeing was confusing. "The communications loops were chaotic for about 60 seconds," Kranz said. Haise explained it was equally unclear for the crew. "We had seven caution and warning lights on," he said. "Generally, there was never a failure in one system that would go across so many different systems." Lovell noted that a look outside would tell him more than the instrumentation in the CM. "It really was not until I looked out the window and saw the oxygen escaping from the rear end of my spacecraft that I knew that we were in serious trouble," he said. "It began to become clear that we had moved into 'survival mode' when Jim looked out the window and said he was seeing venting out there," Kranz said. "It was the oxygen tanks that were the source of the venting." One of two fuel cell oxygen tanks in the service module had exploded. Damaged Teflon insulation on the wires to the stirring fan inside oxygen tank 2 allowed the wires to short-circuit and ignite the insulation. The fuel cells generated the command-service module's electrical power by combining oxygen and hydrogen. When the oxygen tank ran dry, the remaining fuel cell shut down, leaving only the CM's limited-duration battery power. "Glynn (Lunney) recognized that we had a series of decisions to make relative to the path home so he was already down in the trench with the trajectory guys," Kranz said. The Mission Control "trench" was the front row of consoles closest to the tracking map. The flight controllers there included the flight dynamics officer, called FIDO, and the guidance officer, GUIDO. "They came up with five return-to-Earth options," Kranz said. The lunar landing mission was aborted and the crew was forced to shut down the CM completely to save its battery power for re-entry. The astronauts then powered up the lunar module to use as a "lifeboat." "When my (flight control) team came on, we were aware that the lunar module has lots of capability as a lifeboat," Lunney said. "The problem was 'how are we going to deploy that capability?'" Kranz and Lunney next directed Lovell, Swigert and Haise to perform a 30.7-second firing of the LM's descent engine to put the spacecraft on a return trajectory, looping around the moon and gaining a boost from the lunar gravity. The descent engine was used again two hours after the closest approach to the moon's surface. With the support from contractors and universities, the flight control team demonstrated considerable ingenuity under pressure, overcoming the challenges of low power, limited water and lack of other consumables. It was an example of NASA developing innovative solutions that dramatically improved the agency’s capabilities in dealing with the unexpected in years to come. Availability of lithium hydroxide (LiOH) for removing carbon dioxide from the LM's air presented one of the serious problems. The LM's stock of LiOH canisters was not sufficient to support the three-person crew during the four-day return. The lunar lander was designed to support two crew members. The CM had an adequate supply of canisters, but these were cube-shaped with the LM's canisters cylindrical. Engineers were faced with needing to put a "square peg" in a "round hole." "Ed Smylie, who was chief of the crew systems division, got his team together to figure out what hardware there was in the command and lunar modules," said Kerwin, who also was a capsule communicator during Apollo 13 and a member of the Skylab 2 crew in 1973. Smylie's team improvised a way to join the CM canisters to the LM's cylindrical canister-sockets by drawing air through a space suit hose. The plan now needed to be communicated to the crew. "I'm sitting at the capsule communicator console and here comes Ed and his team carrying all this stuff," Kerwin said. "They dumped it down on the floor and Ed says, 'Kerwin, get down here. We're going to teach you how to do this so you can tell Jack (Swigert).'" In spite of the hardships caused by limited power, loss of cabin heat and the critical need to improvise the carbon dioxide removal system, the crew returned safely to Earth on April 17, 1970. The CM safely splashed down in the south Pacific Ocean, four miles from the recovery ship, USS Iwo Jima. The day after the splashdown, President Richard Nixon awarded the Presidential Medal of Freedom to the crew and the Apollo 13 Mission Operations Team for their unyielding efforts during the mission. "You seldom heard the personal pronoun 'I,'" he said. "Most of the time it was 'we,' because we trusted each other." Lousma, who would later be a part of the Skylab 3 crew in 1973 and command STS-3 in 1982, commented on the professionalism of the crew and flight control team. "We just responded as we had to," he said. "It was dynamic, people working real hard to find out what the problems were. It was a bunch of people who were trying to solve these problems as they came up. When Ron Howard made the ("Apollo 13") movie and everybody found out what really happened, people saw that it was one of NASA's finest hours." In 1994, Lovell's book "Lost Moon" was published and became the basis the following year for the motion picture adaptation, "Apollo 13," directed by Howard. In the movie actor Ed Harris, who is cast as Kranz, states, "failure is not an option." Kranz became so associated with the phrase, it was the title of his autobiography published in 2000. "Failure is not an option" was in fact coined by "Apollo 13" screenwriters Al Reinart and Bill Broyles. It is based on similar statements made by Kranz and flight dynamics officer Jerry Bostick as they were interviewed for the movie's dialogue. Haise went on to command the first, third and fifth Approach and Landing Test free-flight trials of the prototype space shuttle Enterprise at Edwards Air Force Base in California in 1977. During the 1980s and 1990s, Haise served as president of Grumman Technical Services Inc. at Kennedy as part of the Shuttle Processing Contract Team. After leaving NASA, Swigert was elected to the U.S. House of Representatives from Colorado's 6th district in November 1982. However, he died a month later before being sworn in. The evening's celebration concluded with Lovell placing the mission of Apollo 13 in historical context. "The flight was a failure in its initial mission," he said. "However, it was a tremendous success in the ability of people to get together, like the mission control team working with what they had and working with the flight crew to turn what was almost a certain catastrophe into a successful recovery." Proceeds from the Apollo 13 anniversary event benefit the Astronaut Scholarship Foundation (ASF), a nonprofit organization established in 1984 by the six surviving Mercury 7 astronauts. Through the garnered support of astronauts, industry leaders, educational institutions and patrons, ASF awards merit-based scholarships to the best and brightest university students who excel in STEM -- science, technology, engineering and mathematics. Since its inception, ASF has awarded over $4 million in scholarships to more than 370 of the nation’s top scholars.